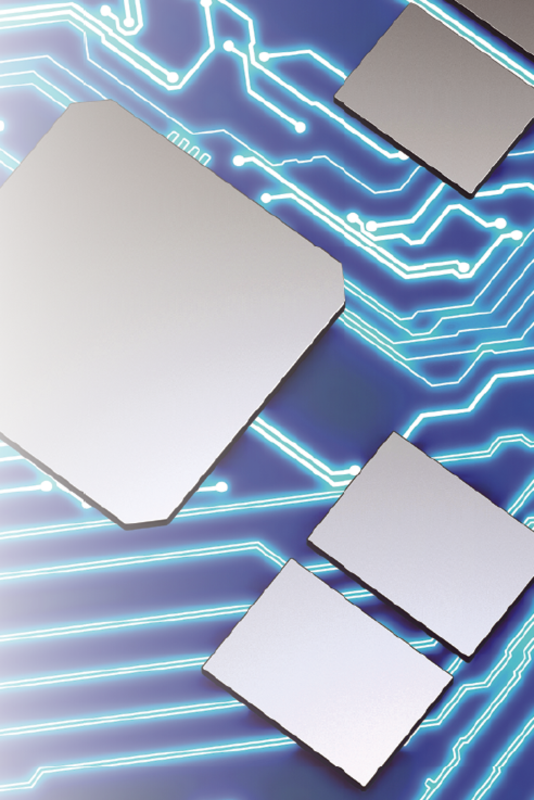 RUAG increases the performance of electronics products with COTS components. Image is courtesy of RUAG. The company advances processes to bring customers to the forefront of the industry. A prime example lies within the manufacturing of the firm’s payload fairings. RUAG Space can boast a history of fairing production with a 100 percent mission success rate and has solidified its role as a global leader in carbon structures for launch vehicles. In terms of reliability, RUAG has that covered. However, for our customers to continue to meet the demands of the industry, the company saw the need to push for more. To that end, RUAG dove in, focusing efforts on making access to space more affordable — and the company became one of the pioneers in Out of Autoclave production. In 2016, RUAG opened a new state-of-the-art production facility in Emmen, Switzerland. 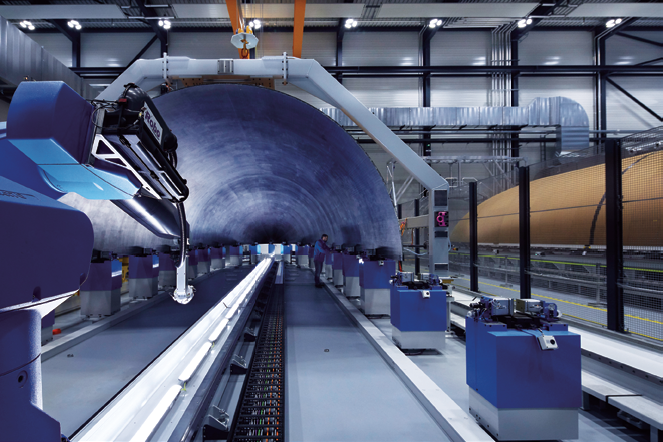 It was at this location that RUAG inaugurated the new process that used an industrial oven instead of an autoclave, allowing the massive carbon fiber components — which constitute one-half of a payload fairing’s — to be economically produced in a single piece. The ambient pressure of the oven hardens the composite structures, as opposed to the autoclave process of excess internal pressure. The cost savings from such an industrial oven, enabled us to go bigger. A bigger oven means bigger pieces. Entire half-shell pieces can be cured at a time, eliminating costly and time consuming vertical integration of numerous shell elements. The new process reduces throughput time by 50 percent and enables RUAG to increase the delivery volume and sequence for payload fairings. Non-destructive inspection machine. Photo is courtesy of RUAG Space. Other major elements in the process, such as laser-assisted layering, the completely automatic nondestructive testing and the ergonomic horizontal integration station all contribute to the new, leaner, faster, better process that RUAG Space is now known for completing. RUAG’s first Out of Autoclave fairing made its successful debut in June of 2017 on an Ariane launch — the Vega fairings flew next. Meanwhile, in the U.S., RUAG was opening doors on their new facility in Decatur, Alabama, which was designed to replicate Emmen, but with even leaner process updates and boasts an even larger oven, with the ability to cure a fairing up to 8.5 meters in diameter. The ability to have these lean, Out of Autoclave processes on both sides of the ocean provides increased cost savings to the firm’s customers, now in the U.S. as well as in Europe, and avoids costly transportation fees. This is representative of RUAG’s dedication to meeting new space demands and a willingness to be in close proximity to customers. Just this month, as the 100th RUAG fairing on Ariane 5 is prepared to take flight, the first major milestone in the production of American made fairings is also underway. The company’s willingness to innovate and grow within the new space environment does not begin or end with fairing production advancements alone. The culture of RUAG Space, led by Chief Executive Officer Peter Guggenbach, extends to all product groups within RUAG Space. Automated potting machine. Photo is courtesy of RUAG. Take, for example, the building blocks for on-board satellite and launcher computers. In an effort to meet the needs of the customer in terms of performance and cost, RUAG Space is making use of standard components for the design of these computers. By using Commercial-Off-The-Shelf (COTS) electronic components and qualifying them for space — rather than expensive, specifically designed for space components — RUAG Space is bringing lower-cost options to the space industry. The use of COTS components generates 10 times the performance, reduces the lead time by a multiplier of 20 and costs 50 times less to build. In terms of speed? 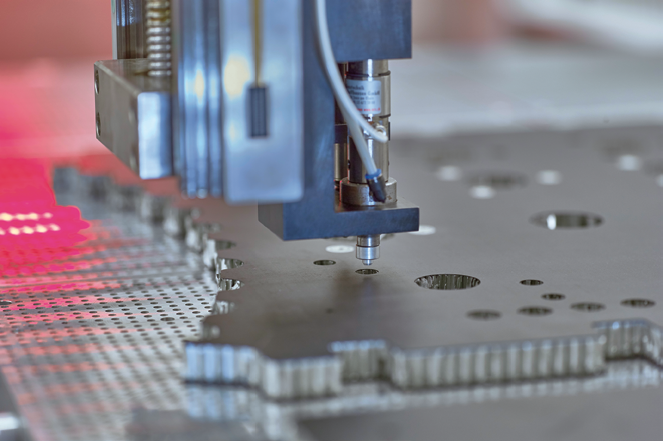 The Automated Potting Machine (APM) that RUAG Space brings to the industry automates the process of insert placement into composite sandwich panels for satellites. With complex satellite sandwich panels that can require more than 800 inserts per piece, the original process could take as long as a month for completion. This machine, along with RUAG’s patented insert, can place as many as 15,000 inserts per day, reducing the lead time on satellite panel production down to one day. RUAG is about to install the second of these machines in the Titusville, Florida, facility. This automated manufacturing process for satellite panels lowers throughput time, significantly reduces cost, and raises quality for our customers with precision insert placement. It also provides an increase in flexibility for customers to modify insert patterns later in the process, and lessens the need for compound glue additives. Less time, less weight, less money. Examples can be found across all product groups of RUAG Space as to how innovative thinking and the improvement in processes is second nature to the company’s culture. This is what enables the company to meet the demands of today’s industry and what makes us RUAG Space. Chrystal Morgan is the Director of Communications for RUAG Space USA. She has worked in the public, private, and education sectors in the field of Communications, most notably as Director of Research Communications for the University of Alabama Huntsville and at NASA’s Marshall Space Flight Center in mission operations as a Payload Communicator.